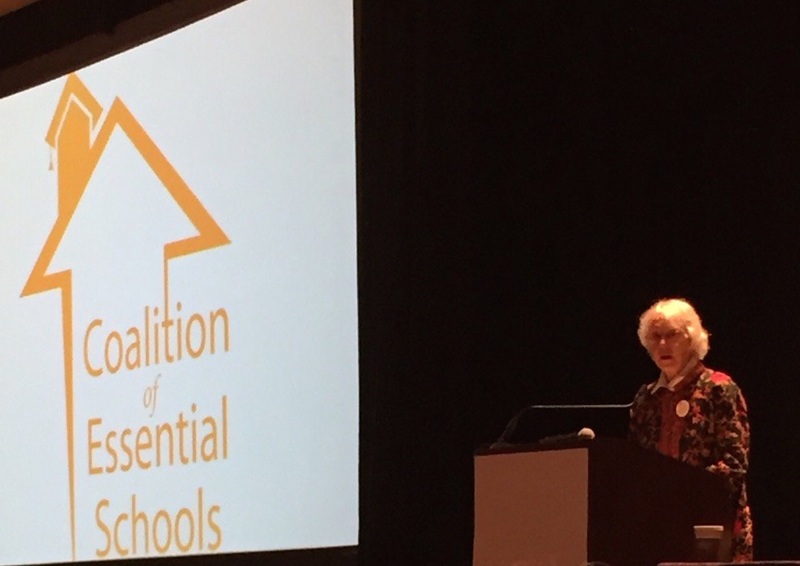 Nancy Faust Sizer–author, educator, CES Executive Board Member, and wife and partner of CES founder Ted Sizer–concluded Fall Forum 2016 with these remarks, which we are honored to share with you. I came down here this weekend determined to be brave. I had my “talking points” all ready. First, I planned to note that Ted was an historian: he knew that reform movements don’t last forever, especially those, like ours, which are so dependent on philanthropy. Our ideas, while sensible and popular with many in high and low places, are not locked into law. They are expensive, as innovation always is: it takes time and people-hours to learn what truly works. It’s been a while since foundations were likely to support a group that was so firm in its commitment to make assessments broader, more accurate and less harmful than external standardized tests. Third, we have had a “big tent,” and, usually, we’ve had the ability to communicate with everyone in it. We have not agreed on every issue, but we have respected the opinions of those who have chosen to do this gratifying but very hard work. We have known that “no two children are quite alike.” But even we have seen that it’s a lot easier to agree about what is wrong than it is to design a system—or a school—which will benefit every child who is dependent on it. “Context is everything,” Ted insisted, and this has been our strength, but also, in some ways, our weakness. So these were the thoughts that I have shared with the CES Executive Board, my friends, and my children for quite a while now, and these were the thoughts that I planned to share with all of you. But once here, listening to these inspiring speakers and just-plain-dedicated and smart school people, I want to take it all back. The loss we are experiencing is not just political, or intellectual; it is emotional. You are the people I have looked forward to seeing for the last 30 years. Your stories have fascinated me. We have grown up together, have experienced victory, defeat, inspiration, and occasionally, despair. Just for one minute, I want to acknowledge that. Let’s stay in touch, in every way we can. Keep our lines out to like-minded reformers, go to their meetings. I already have my eye on one next year. Maybe I’ll go to two if you let me know about it. Let’s have podcasts instead of workshops, films instead of speeches, telephones instead of roundtables. The luckiest among you have schools to support your work, and you need to write about your work every chance you can. Ted described himself as “the CES cheerleader.” We all knew what he meant, and appreciated it. But lately I’ve been thinking that, for my life and for yours, the metaphor should be “training wheels.” Ted kept us steady while we negotiated the tough job of summoning energy and deciding a direction. Later, the training wheel function moved to CES itself. It provided a backdrop for all our individual efforts in reform. Now it is time for us, not to stop, but to continue our journey, strong and sturdy, basically on our own, but always traveling to where we can serve kids, and find worthy colleagues. I guess that’s what I want to say. We are doing what Ted called “God’s work,” and will continue to find meaning in it. We’ll be okay. But I’ll miss you.